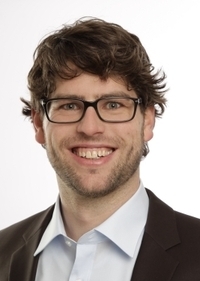 Dr Bastian Schmitt can look back at more than ten years of experience in the field of solar process heat. As part of his doctoral thesis, the mechanical engineer developed a classification system for the integration of solar thermal systems providing process heat on industrial premises. Today, he is a member of Task 49 of the IEA’s Solar Heating and Cooling Programme and heads the working group Process Heat at the Institute of Thermal Engineering (ITE), a department of the University of Kassel, Germany. Solarthermalworld.org spoke with him about the latest research into solar thermal integration and the goals set in last year’s guidance document. Solarthermalworld.org: Under the auspices of German research project SolFood – Solar Heat for the Food Industry, you offered Guidance on Pre-planning Solar Process Heat Installations. What did you aim for with this document? Schmitt: Our goal was to make it easier for managers and consultants in the energy sector to familiarise themselves with process heat. With the help of these self-learning guidelines a planner can create a prefeasibility assessment for a manufacturing business, including a size and yield estimate, without substantial upfront costs. Our intent was to greatly simplify the very time-consuming task of pre-planning. The guidelines will assist the planner or solar supplier during project acquisition, and they are thought to spark interest in solar heat among stakeholders from energy planning. The results can also be used for other renewable heat sources, such as CHP plants or industrial heat pump systems. Solarthermalworld.org: In the guidance document, a planer will find tables to assist with yield estimates as well as storage and collector field dimensions. How did you create these tables? Schmitt: The tables are based on very extensive simulation runs. We have validated a deck file within TRNSYS for applications below 100 °C with the help of an existing solar process heat plant. This means that we carried out simulation runs under different conditions (different loads, temperature levels and locations) to be able to determine the solar plant’s utilization ratio – the efficiency throughout an entire year. To arrive at a solar yield estimate, the planer only has to multiply the utilization ratio with the irradiance found at the prospect’s planned collector site – this estimate is paramount to the plant’s feasibility. Basically, the guidelines can be used not only across Germany, but for any European location whose solar irradiance figures are stored in a database like Meteonorm – although the guidance document has so far been available in German only. Solarthermalworld.org: What impact did your doctoral thesis have on these guidelines? Schmitt: My doctoral thesis included a systematic approach to capturing and classifying conventional processes and types of heat supply across the industry. My research has led me to the conclusion that opportunities for solar integration depend less on the process, but rather on the conventional heating equipment. The assumption used to be that, for example, pasteurisation was per se a suitable match for integrating a solar heat system, as the temperature levels required were significantly lower than 100 °C. This is certainly true for a tunnel pasteuriser, which gets its heat from an external heat exchanger. But the commonly used flash pasteurisation, during which products are pasteurised by means of large plate heat exchangers, makes it difficult to incorporate an external heat source. Based on our approach, the question “What type of conventional heating equipment is used to heat the process?” decides what opportunities there will be to make use of solar heat. Classification of heating processes in the industry and possible integration approaches. Solarthermalworld.org: Your guidelines differentiate between 15 different integration approaches. Don’t you run the risk of confusing planners to some extent? Schmitt: Well, the different integration approaches do not all refer to the same level. A clear distinction can be made between the supply and process level, with the former allowing for a much more universal integration and higher temperatures. Additionally, we consider the heat transfer media used, which mostly concerns the supply level. 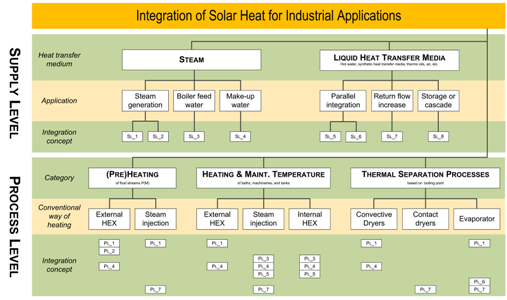 Depending on whether a company utilises steam or a heat transfer fluid, the choice will be limited to four approaches towards solar heat integration. To be able to differentiate the various processes at the process level, it seems sensible to assign them to a certain heat consumer. There are three basic criteria to distinguish here: (pre)heating of fluid streams, heating and maintaining the temperature of baths, machinery or tanks, or thermal separation processes. In addition, there is the matter of the conventional heat supply of the process as described above. All in all, there are seven possible approaches to integrate solar heat at the process level. The number gets smaller based on which heat consumer category and conventional heat source we are talking about. Solarthermalworld.org: Did these categories find their way into the Integration Guideline of Task 49, which was published at the beginning of last year? Schmitt: In fact, they did. Chapter 5 of the guideline explains in detail the categories for which we developed diagrams of solar thermal integration. This classification allows for an industry-crossing categorisation of most processes and approaches used in manufacturing. The document also includes one of our diagrams which describes the acquisition of projects in eight steps: the first two for the prefeasibility study, five steps for the actual feasibility study and two for the decision stage. Solarthermalworld.org: Are the guidelines a joint effort by the Task 49 team? Schmitt: As part of our work on Subtask B Process Integration and Process Intensification combined with Solar Process Heat, we sat down in a small group to define the guideline contents, which have benefitted from significant contributions by the leading institutes on process heat in the German-speaking region: the University of Kassel, ISE Freiburg from Germany and AEE INTEC from Austria. The guidance document summarises where we are when it comes to global research on integration, the identification of heat sinks and the classification of approaches towards solar process heat. It should be used globally, even for manufacturing companies which employ processes requiring heat above 100 °C. Solarthermalworld.org: The Integration Guideline has almost 100 pages, whereas the planning guidance mentioned at the beginning counts 63 pages. What additional information does the Task 49 document have to offer? Schmitt: The Integration Guideline places added emphasis on identifying and examining heat sinks in manufacturing businesses. To do that, the document introduces the Pinch analysis, which is used to determine all streams that have to be heated up or cooled down during production. This makes it possible to estimate the maximum potential of heat recovery, which should be tapped first before integrating solar heat technology. Dr Bastian Schmitt interviewed by Bärbel Epp. Translated from German by Björn Vrooman.